If you're one of the few people following this blog, I apologise for being boring, but I’m going to add just a few more photos of our recent walk along El Camino across France and Spain. We started last year when we walked from our front gate in Mézin to the Pyrenees. So this is the second stage of our 1200 km odyssey to Santiago de Compostela. (El Camino is the Spanish name for the old Pilgrims' route that started in the Middle Ages to help naughty people get to heaven. We're doing in several stages over a few years. But why are you taking so long, you may well ask? Because it's a long way and we're old, that's why). 1. Lynne on a footpath to Roncesvales near the top of the Pyrenees. Once you set out on the Route Napoleon from France, the monastery at Roncesvales is the first stopping off place in Spain. This involves a 25 km hike (for us a full day) across the mountains. 2. A great hilltop advert for alcohol in Spain. 3. At another monastery near Estella, you can choose to fill your water bottle free at either tap: one delivers water – the other gives you as much red wine as you want. (Lynne wanted to stay here for a few weeks). 4. A simple drawing of a fountain for pilgrims that only, alas, gives water. I promise I’ll get back to art matters from now on. 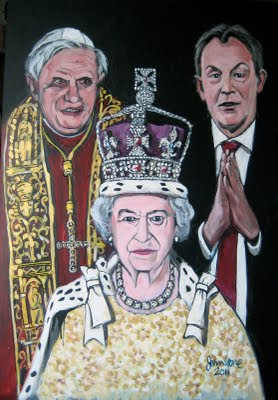 As all you avid readers of this blog will doubtless remember, silly old people do some very silly things. I'm referring of course to our plan to walk from our front gate along the Pilgrim's Route to Santiago de Compostela in far western Spain. We got to the Pyrenees last year, a distance of just over 200 kms in just under two weeks. Great fun, but hard work. Anyway, it's over 1,000 kilometres from our house in Mézin to Compostella - and there's a long way to go - so we decided to start out on stage 2. (If we're still around, we'll give the next stage a go later this year - and with luck, one day we'll get to Saintiago and complete El Camino). Last time we stopped at the frontier town of Valcarlos (just past St Jean Pied de Port) so that's where we started from this year. We went up the old Pilgrim path from the bottom of the Pyrenees to the top in one day - but what a day! Up and up and up. And then up some more. Then, just when we thought we were at the summit, there was lots more mountain to climb. Well, after lots of adventures in Spain, we made it. It was a truly great experience, and we arrived, as planned, in San Domingo de la Calzala - of cheap Rioja and chickens in the cathedral fame - exactly on schedule: 215 kms in nine and a half days. Not too bad for old farts like us. Outstanding walking, superb views, amazing countryside, interesting villages and of course Lynne had a very good guide and truly excellent company all the way. Met our neighbours Sue and Andy for two evening meals and they helped us cheat (just a little bit) by taking one of our bags on one of the days. The above pics give an impression of what Lynne felt about the trip. Note: with one meal we were offered ONE free drink. We asked for wine and that's how it was served: pint jug of Rioja. Not a bad reason to visit Spain as often as possible. Well, they do protect us don't they? 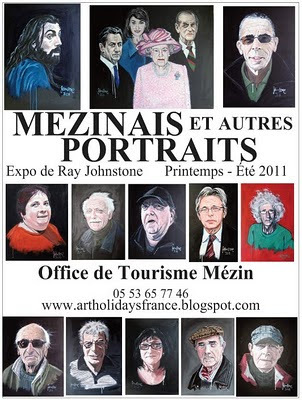 Tourist Office in Mézin to see MÉZINAIS ET AUTRES PROTRAITS. But, you may ask, what about the people you say I'm sure to know? You can see Lynne on her way to a hanging by clicking on this sentence. (If you're still reading and interested, it contains photos of all the portraits I painted up to the end of 2010 - plus all the paintings that I've done over the past fifty years that I feel are important to me - 187 photos of my work - plus a few others). Call it propaganda if you like, but I started painting this composite portrait composition just after the Allies started to bomb Libia. Enough said, I think. 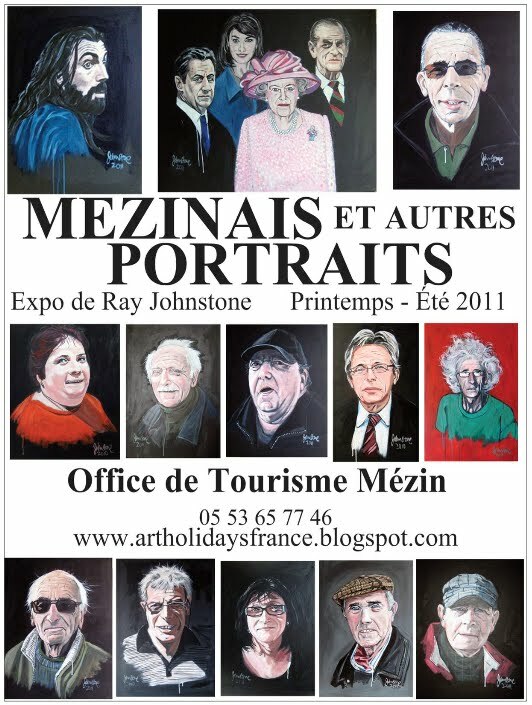 You are sure to see paintings of people you know if you visit the exhibition MÉZINAIS ET AUTRES PROTRAITS by artist and art teacher Ray Johnstone. Since arriving in Gascony eleven years ago, Ray’s subjects and many exhibitions have included pigeonniers, petanqueurs and villages all over southwest France. 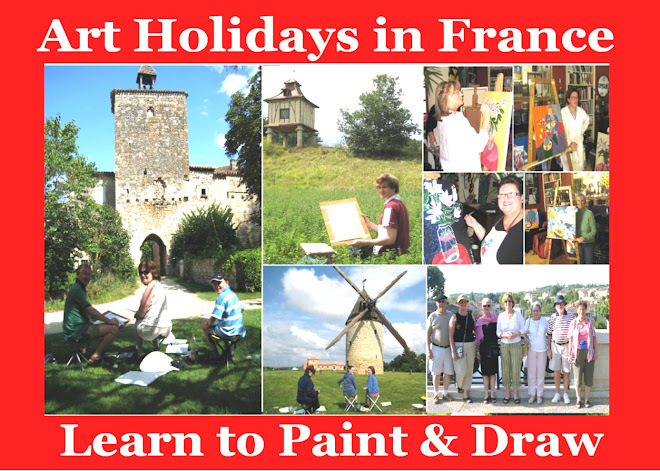 In his summer 2011 show at the Tourist Office in MÉZIN ( Lot et Garonne) you will meet the whole gamut of village characters - from the Maire and the curé to the hairdresser and the boulounger – including many of the the hoi polloi. But what about the people you are sure to know? 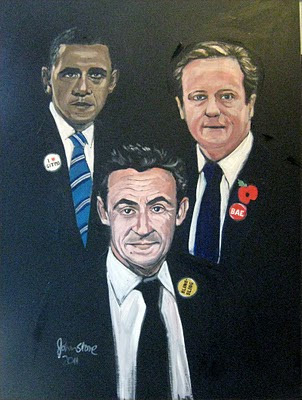 Well, for this exhibition Ray as and added an extra element of interest - also included are portraits of several French and British VIP’s – Her Majesty and Prince Philip are there, and so are President Sarkozy and Carla Bruni. 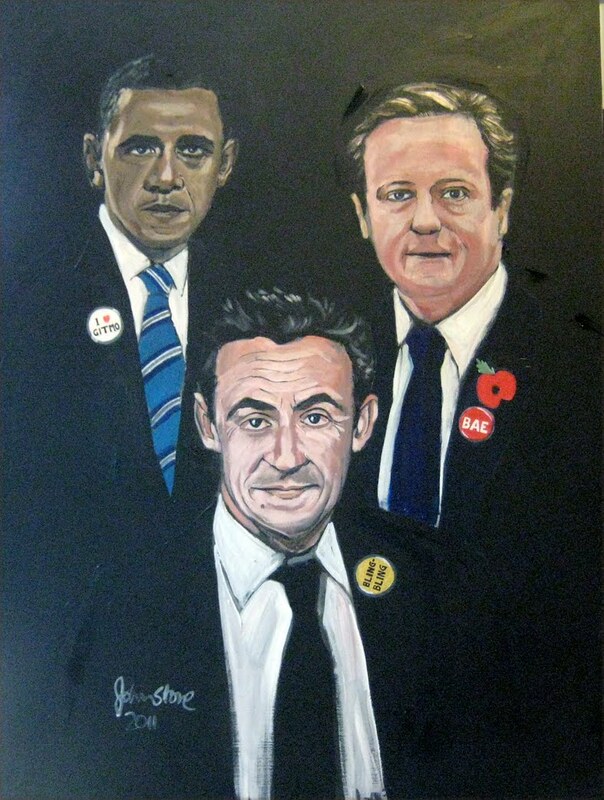 And as an added bonus, none other than the President of the United States.